after some pony buys at the fleamarket I checked my „My little Pony – need to be washed and brushed“-box and look what I found! 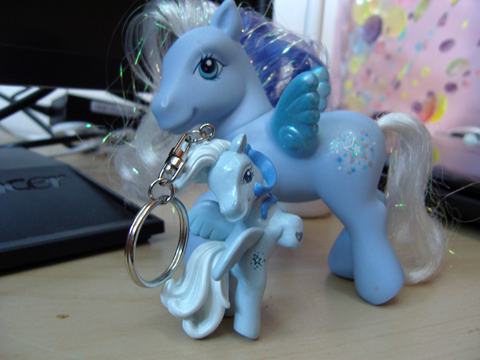 I knew there was something special about the keychain, that I had seen the according G3 pony XD I wouldn’t have expected to find it in a box in my living room, but now the two are together next to my computer, so I can look at them! Thank you so much! It’s so great that you have both together! I’m so happy that you like my gift! As I told you, I bought the same for me too. I’d be happy to see all you little pony collection. Weeks and weeks ago I saw a little pony unicorn at the supermarket and since this time, I often look at him but I think (I can’t buy it, it’s too childish and I have to be careful with my moneyâ€ but I think I won’t be able to wait more!! Hoping it’s still in the supermarket, I like this one and not an other! And thanks for all your short letters and I hope you passed your exam and you can relax now. I’m sad, I didn’t find the little pony unicorn at the supermarket, it seems it is not sold anymore. Where do you buy yours on the net? I’m very sad, I know it’s stupid but I don’t feel fine lately, I think you can understand… I don’t remember the name of the little pony, I only know it’s a white unicorn.